Education is one of the keys to success. When you are new to tangible assets investing there are several terms that may not be familiar to you. Here we break down and define 9 terms to help you get started on your precious metals investing journey. Fiat currency is defined as "paper money," that is not backed by precious metals. The 5s, 10s and 20s in your wallet represent fiat money that is made legal tender by government order. Typically, there is no intrinsic value to fiat currency. The concept is important because governments can expand the money supply simply by printing more fiat currency, with nothing to back it up. In severe cases that can lead to inflation, where the purchasing power of the fiat money falls significantly. The gold/silver ratio represents the number of ounces of silver it takes to buy one ounce of gold. 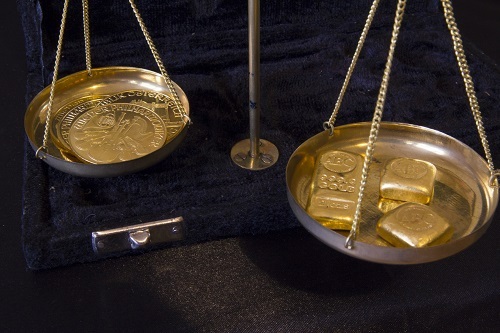 The gold/silver ratio is one way investors measure the relative value of gold and silver. The ratio is also used as an effective timing mechanism to signal strong long-term entry points for precious metals purchases. Silver currently offer better "value" than gold. Historically, readings above 65 signal that silver is severely undervalued and is a strong buy signal for the metal. Currency that can be used in daily commerce. You may not know but the 1 ounce American Gold Eagle is legal tender. However, you probably don't want to use it to pay for your dinner out. The coin's legal tender value is $50 compared to the current value of the coin (prices fluctuate daily). Liquidity refers to an asset that can be easily bought and sold. A liquid market is deep and has many buyers and sellers. Both physical gold and silver can easily be exchanged for cash. They are considered to be extremely liquid assets, due to the enormous large number of investors who actively buy and sell these metals around the world. Physical gold is recognized as having value in every country around the globe. Peak gold refers to the idea that there is a limited supply of gold that we can still mine from the earth and specifically refers to the date that the maximum rate of global gold extraction is hit. From that point on, gold mining will shrink until it eventually reaches zero. In 2015, a Goldman Sachs report suggested that there are only two decades of "mineable" gold left in the ground. The Wall Street firm also estimated that there is only about 40 years left of platinum, copper and nickel reserves. The price of a coin over its bullion value. Each gold bullion coin carries a small premium over the spot price of gold – usually 3-4% – to cover its manufacture and handling, but that premium is a part of the return investors receive when they sell. The back side of the coin. The side usually opposite from the portrait or date. Unlike a typical 401k or IRA, a self-directed IRA account allows investors to purchase and hold tangible assets in a retirement account. Yes, you can buy and hold physical gold in a self-directed IRA. There are IRS rules surrounding what types of physical metal can be put into an IRA. There are a variety of IRA approved coins that investors can buy and hold for retirement. See them here. The spot price represents the live, current price of gold and silver traded on the global markets. This is determined by the over-the-counter and futures markets. You can monitor spot prices here. What questions do you have about precious metals investing jargon? Leave a comment below or call a Blanchard portfolio manager today to ask any questions you might have? Reach us at 1-800-880-4653 or by email here.